On April 1st, 2011 Ghost Post launched a subscription based social media marketing service providing an affordable, personal and effective solution for businesses that are looking to strengthen their online identity and brand awareness. Ghost Post is a business tool that every business owner should use to manage their facebook and twitter accounts. Ghost Post, a social media marketing agency based in Beverly Hills, California, officially launched a revolutionary social media ghostwriting service. The Company's extensive team of social media writers and marketing experts work with business owners to enhance their online identity and maximize brand awareness. Ghost Post's professional writers update social media accounts like facebook, twitter, linkedin and foursquare. Unlike most marketing agencies and public relations firms, Ghost Post's services are conveniently priced by the frequency of updates performed each month. Currently Ghost Post offers four levels of service (Shadow, Zombie, Ghost & Phantom) with it's entry level "Shadow" subscription starting at $39.00 per month, which includes up to 15 posts per month. “Most business owners don't have the time to update their social media accounts or simply don't speak the "language" that is necessary to reap the benefits of social media." said Daniel Abas, CEO of Ghost Post. "Social media is a crucial business tool for success in today's marketplace. Business owners are turning to Ghost Post to help them promote their brands, enhance customer service and help them attract more loyal customers." Social media has validated its presence as a business and marketing tool with search engine giants like Google, Bing & Yahoo directly monitoring "likes" and "followers" into their search ranking algorithms. "People have become desensitized by traditional marketing. You have to turn your customers into loyal friends, and great friends listen first, then speak." Abas added. "These days, having mediocre or sporadic updates to your twitter or facebook accounts can actually hurt your brand, Ghost Post is here to fix that." Ghost Post (http://www.ghostpost.com) is a subscription based social media marketing service providing an affordable, personal and effective solution for businesses that are looking to strengthen their online identity and brand awareness. CEO & Founder Daniel Abas, MBA, (@dannyabas) a serial entrepreneur and native of Los Angeles blends media, technology and professional services to form online companies on a global scale. He is also the owner of Red Butler (http://www.redbutler.com), a global concierge company that provides corporate concierge services to Fortune 500 corporations and affluent professionals. GhostPost.comGhost Post, Social Media Marketing for your business. Social Media MarketingGhost Post provides social media marketing services for your business. 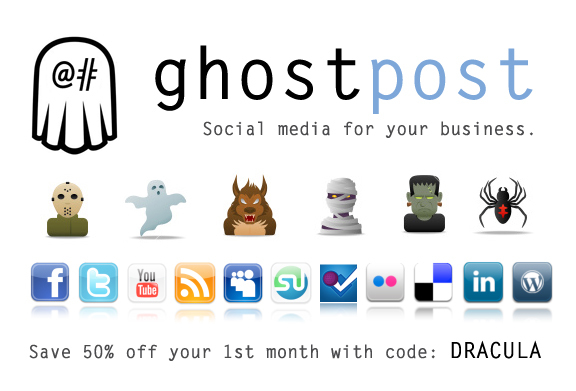 Ghost Post BrochureGhost Post offers 4 levels of service taking the scary out of social media.